Health ministers of South Korea, China and Japan gathered this past weekend to discuss ways to jointly fight contagious diseases and expand cooperation on health-related matters, Seoul's government said Monday. 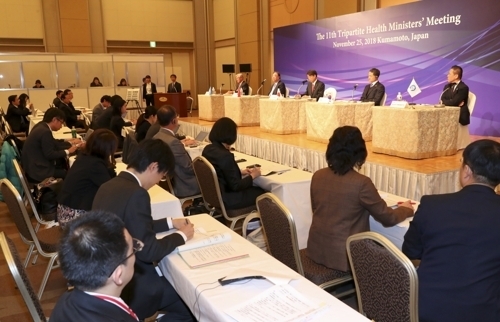 The Ministry of Health and Welfare said the policymakers met at an annual regional meeting, the 11th of its kind, in Japan's Kumamoto Prefecture on Saturday and Sunday. "We will strengthen cooperation in information sharing on diseases, monitor impending health issues and jointly deal with all kinds of threats that stem from contagious diseases," the officials said in a joint declaration. The ministers discussed ways that the countries can share information on the diagnosis and prevention of potentially fatal contagious diseases, such as highly pathogenic avian influenza. Health and Welfare Minister Park Neung-hoo met with his Japanese and Chinese counterparts to discuss other related issues on the sidelines of the gathering. Park emphasized to his Japanese counterpart, Takumi Nemoto, the need for international cooperation as some multinational drug giants are unilaterally increasing prices.